High Spirits was absolutely entertaining! 85% of the book is the same as Blithe Spirit. Although I know the story, there are songs on the original cast recording, which I adore, that I couldn't imagine how they fit - but now it all makes sense! A ha! The ending is different than the play and got a big laugh. The Mufti cast was absolutely fun. I dare say that Howard McGillin was a more charming Charles than that movie star playing over at the Shubert...plus that singing voice! I love seeing Veanne in anything - she's always so delightfully quirky. Carol Kane was terribly funny and loopy as Arcati. As Elvira, Janine tore it up - especially the number Home Sweet Heaven. With no room for an orchestra, the wonderful score was played on two pianos by Steven Freeman and Bobby Hirshhorn. 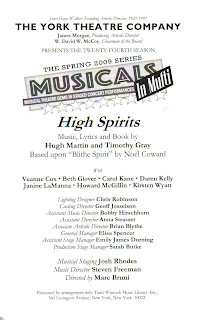 The original Dr. Bradman from the 1964 High Spirits, Larry Keith, was in the house as was the current Broadway Blithe Spirit Dr. Bradman, Simon Jones. Susan Louise O'Connor, who plays Edith in Broadway Blithe Spirit, was also there. What an extra treat! After, we went backstage to say hello to Veanne and then crashed the cast party. Mufti (muffftee), which means "in street clothes without the usual trappings", was like a miniature, very well done, Encores! In fact, the creative director joked that Mufti means "shows that Encores! should do". Given how horrible the sightlines are at City Center and definitely more costly (although you get the full orchestra), I'd put my money down for another Mufti any time.